So, you have written a book and want to market it? Well, you may have come to the wrong place, but hear me out. I am a self-published author and I have dabbled in making my book marketable. The results have been less than successful. So why read a book marketing guide by somebody like me? Well, the principals are still the same whether I have been successful at using them or not. Also, you often learn more from failure than from success. Here you will find an outline of the basic self-publishing marketing steps. In order to get attention, you need to attack this problem from several fronts. Let’s start with the most important one. YOU NEED AMAZON REVIEWS! LOTS OF THEM! As I am writing this article, I have a grand total of ZERO! Yes, this is really bad and I am working on it. The first part of the plan is to send a copy of your work to every friend you have. Two months later, pester them (often) for a review. Keep this up until each one of them writes their review. This is the essential foundation and it is absolutely critical to your success. This is also the step I am stuck on. There is still one site that you can buy Amazon reviews. $300 buys you up to 10 badly written reviews. Should you do this? The reviews of the reviews say no, but still consider this option. Also, it is likely that Amazon will sue them into the ground soon, get their list and do something to the people who paid for reviews. Be careful! If you read my previous blog, you will have by now written at least 200 book reviews on Goodreads and Amazon. Consider posting these reviews to Barns and Nobel and Kubo. Your new goal is to look for books on Goodreads that only have a few reviews. Comb through them to see if they have a website or some other external way of contacting the author. Email them and say that you will do a review exchange. This means that you offer to buy their book on Amazon, at least pretend to read their book and write a review. In addition, you then cross-post your review to Goodreads. The other author will look at your 200 reviews and feel that they are getting a good deal. Is this ethical? It’s a simple review exchange. You’re not getting paid or doing something dishonest. The important part of this is that you are requesting externally to Amazon and Goodreads. NOTE: both sites monitor their internal communications and “review exchanges” would get their attention. Another source of authors is on forms like Writers Helping Writers. You need a website dedicated to your work. There are lots of great website hosting companies that have great online free website building programs. For example Godaddy. Of course, I chose not to use the online website builders. Why? I am old school and really wanted to make my own site. I wanted a program that I had on my computer that I could endlessly edit offline. My other motivation was that in case the online hosting company didn’t work out, I could take my work to any other web hosting company and put it there. The point is that I had full control. My overall motivation was that this is how it used to be done and I didn’t like the pre-made web pages on Godaddy and the other places. So, my quest began. My first stop was the gold standard Microsoft Front Page. To my great surprise, it is no longer supported. I had used Corel website creator in the past and gave it a try. Wow, had it turned awful. I went through every possible program from Adobe, Google and a bunch of others. Pure junk. I ended up finding a free program called Rocketcake. It was small, fast, worked fantastically and I loved it. The downside was that it isn’t too powerful and it was a bit difficult to get it to work on my host company, WHP. Incidentally, WHP is the least expensive website hosting company. Coincidence? Hmm. Rocketcake did do one thing that the other website builder programs completely failed at. It showed how my website would look on mobile devices. Most Godaddy [and other similar companies] generated web pages look awful on small devices. Do people use the internet on their phones? Hmm. Perhaps there was some logic to my decision. Your next option is to generate buzz on groups like Twitter and Instagram. How do you do this? I have no idea. Twitter and Instagram are simply not my scene. There are online guides that I chose not to read. Next idea is free promotions. Several sites let you post your work for free to generate buzz. I tried this with KDP select with limited results. 15 people downloaded my book with little fan fair. Hire a publicist. This is something I have to investigate further. I have no idea how much they cost or what they do. I know from reading Writers Helping Writers that they can be successful, but I don’t have any metrics. Post often to your blog. Keep your blog fresh and mention your book often. There are Facebook groups for authors and books. For example, Writers helping Writers. However, it seems this group has gone away. Post as often as you can, but don’t be a pest. Do an advertising campaign on Amazon. This is completely counterintuitive. Amazon is supposed to do this for free as they are a retailer. Alas, no. Amazon makes you fork over money to up your rankings. I have not tried this yet, I need to get at least 20 reviews first. Nobody is going to buy a book with no reviews and it would be a waste of money. Do an advertising campaign on Barns and Nobel or Kubo. They seem to be much better at promoting books and I am investigating this idea. I have to get some reviews on their site first. Last but not least, write more books. The more you have, the more you can market on the same dime. It just takes one great book to get lots of people to “buy it now.” I am well on my way to doing this. Unfortunately, that’s all I got on the subject of promoting a book. Now at this point, you should be upset and think, “There have got to be more options. When I search on book promoting, there are hundreds of links.” This is completely true. Let’s explore what these other links are offering. 90% of them do two things. First. they send out spam. Do you read spam? 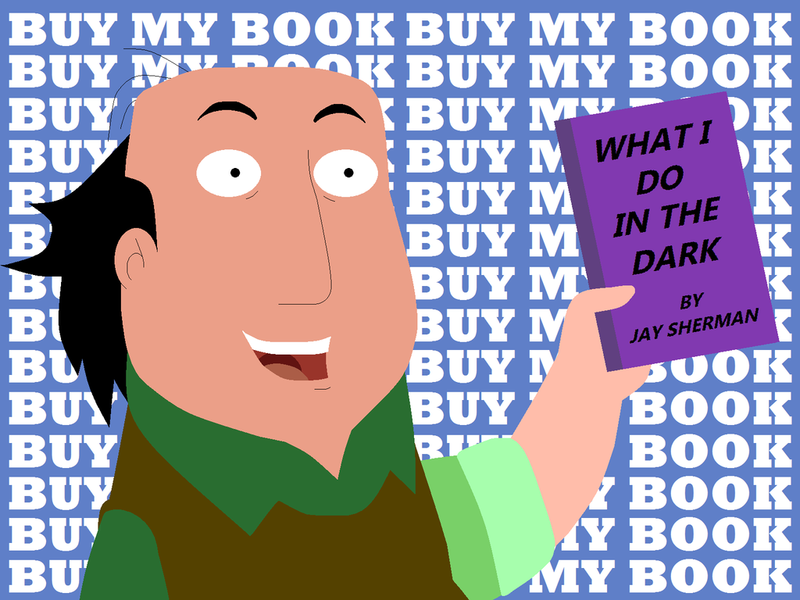 Do you want your great book to be associated with that kind of “gray” marketing? Second. they “tweet to 10,000 followers.” How does this help you? Having 10,000 nobody’s tweet to 10,000 nobody’s. Do these people even speak English? Are they just robots tweeting to robots? Where is the proof that they are doing what they claim? Where is the Return On Investment study to back this kind of marketing up? To me, this approach is a complete waste of money. There are lots of sites that offer to promote your book on their site (for a price of course.) When you send money to “great book site” you can see your book right on their front page. Here is the issue. The only place readers go to find out about books is Goodreads; they don’t care about those other sites. Those “great book sites” only exist to extract money from authors. If you look closely, you can see that they all look kind of the same. I suspect they are made by the same 3 people. There are lots of sites that offer a package deal. The ones I investigated are just a combination of the tweet/spam/put your book on worthless sites. Or they “manage” your Amazon advertising campaign. Or they “promote you on Google.” You can do all of the last two yourself for much less money. What about Book Bloggers? They certainly can promote your work. First off, if they often want $ up front. Second, they are an arrogant group and can give you a rotten review even after you paid them. My suggestion is that if they have a place you can email them a summary of your work then do it. If they respond back asking for a copy, send it. I generally found that these people were high on their own arrogance. You can tell by reading their poorly worded book reviews. What about paying to up your search rank on Google? Hard to say. People generally search for books they already know about on Google and that’s the catch. You want to be known, but nobody knows about you. That is why Goodreads is important. What about getting your book on a website list of “100 great books you have to read.” Hard to say. It is worth investigating. Make sure you are not paying for this option. Your work should stand on its own otherwise the list is useless. Now at this point, you are probably thinking, “You’re not inspiring me.” Ya, I know. This is a tough road to follow. The idea that your work would instantly get read, get positive reviews and the checks would roll in is a fantasy. So where does this lead us? Well, that’s my advice on how to market a self-published book. You now know all the pitfalls and what needs to be done. My best advice is to outline a clear goal and follow it. Hopefully, you understand that this is a long road that is going to require a lot of effort.